Hanging Shelves, Bookshelves, Mounted Shelves &amp; More! How to Hang Shelves: A Comprehensive Guide! Hanging shelves are the latest home fashion icon as homeowners across the world are rushing to install their own set of stylish hanging shelves. Not only are they massively practical, as they magically add extra space into the house, they also maintain their own fashion appeal as well. No doubt about it, knowing how to hang shelves is a big deal nowadays. Whether you are king of the odd jobs in the household or you do handiwork for a living, it’s important to understand what goes into a professional hanging shelf installation. And even if it’s not your first rodeo when it comes to hanging shelves, a reliable and thorough guide is always important to have. 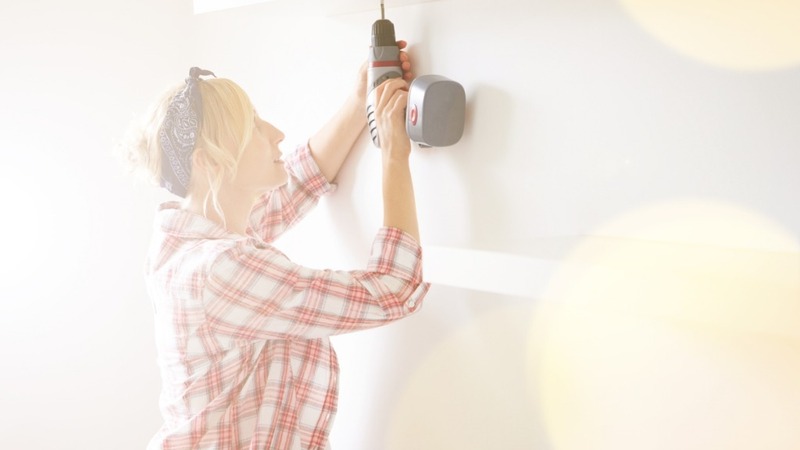 Here we’ve conveniently compiled all you need to know, from tools to installation to maintenance, so that you can confidently and correctly hang shelves. Be the hero of your family or your client when you transform a drab wall into a modern display of beautiful hanging wall shelves! What Tools Will You Need to Hang Shelves? All you need to install hanging shelves time and time again! A bit of a preface–installing hanging shelves should not be very hard for someone who has been around tools before. An easy installation should take about an hour. 1. Determine where the hanging shelves go. This is not as easy as it sounds. When deciding where the shelves should go, you need to take into consideration the weight of the shelf and the weight of the things you want to put on the shelf. If you’re planning on using heavier display items, its best to use a stud finder to search for a stud near the area you want to hang the shelf. Or, you can use drywall anchors. 2. Mark the positioning on the wall. Get help to hold the shelf on the wall where you want it and use the level to ensure that it is flat and perpendicular to the wall. Lightly mark the wall with a pencil to delineate the bottom of the shelf. 3. Mark the holes for the shelf brackets. Now, hold up the shelf brackets to the pencil line you’ve just drawn, and again use the pencil to mark inside the holes of the shelf bracket so you know where to drill. 4. Drill the holes. Use a power drill on its slowest speed to drill starter holes inside the bracket markings. Then, use a screwdriver to screw the screws the rest of the way. However, make sure you do not twist the screws all the way into the wall. It’s just to create the holes; after you are done remove the screws from the wall. 5. Fasten the brackets. Put the brackets into place as you did before and reinsert the screws through the bracket. Twist the screws all the way in this time to properly fasten the brackets. However, make sure you don’t over-tighten the screws and damage the walls. If you were planning on adding a wall anchor for additional stability for the shelves, install one before you fasten in the shelf brackets. 6. Tidy up. Before you add on the shelf itself, take a moment to clean up any pencil markings or drywall dust. You’ll want to do this before the shelf is placed. 7. Hang the shelves. Place the shelves on top of the brackets while checking to see if it is centered. If the shelf bracket comes with openings at the top, secure the bottom of the shelf by inserting more screws. This will provide additional support. There you have it. You’re done with an easy yet thorough installation! If part of your handyman work is to keep the customer satisfied, and it should be, make sure to keep the concerns of the homeowner in the back of your mind. Ask and understand exactly how they imagine their new hanging wall shelves look in their mind, and what they plan on putting on the shelves. Inspect the shelf itself to gauge how well it will hold weight over time. This will help you determine whether or not finding a stud in the wall or using a drywall anchor is advisable. In addition, it means you care about your customers and they will be grateful to you in the future. Reputation is everything in the world of the professional handyman, and an ugly performance on an installation is bad news. Make sure you take the time and care so that your shelves do not warp or break for years to come! Enjoy Hanging Shelves & Bookshelves! A hanging wall shelf installation is an easy yet beautiful home improvement project that has really gained traction among modern homeowners. Join the trend and install them in your home! Thank you for reading and have a happy installation!